Cost to install a window evaporative cooler varies greatly by region (and even by zip code). Get free estimates from air-conditioning and heating contractors in your city. Cost to install a window evaporative cooler varies greatly by region (and even by zip code). How much does it cost to install a window evaporative cooler? Living in warm climates calls for an efficient cooling system. Mostly, everyone is familiar with traditional air conditioning — it cools by taking the humidity out of the air. However, directly opposite to air conditioning is evaporative cooling, which works by adding humidity into the air. It is typically less expensive to purchase and run more efficiently than air conditioners. Window evaporative coolers are similar to average evaporative or swamp coolers, but they only cool a particular room or area and are installed below a window. However, they reduce more leaks than swamp coolers, which are installed on the roof. 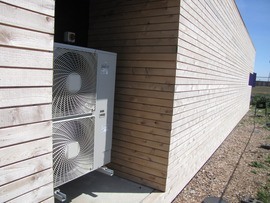 These coolers work in a ventilated room, with either the windows slightly opened or with ceiling vents, providing constant fresh air, as opposed to air conditioners that use recycled air. Also, if you are environmentally conscious, they don't use refrigerants that damage the ozone. Window evaporative coolers come in all sizes and they can cool a large area up to 1,600 sq. ft. or you can get a smaller unit for an isolated area such as 400 sq.ft. Therefore, they are sold based on the area they can cool. For this cost guide, we will explore the costs of installing a window evaporative cooler for a 1,600 sq.ft. one story house, which averages $940 - $1,1000. One of the benefits of a window swamp cooler 1 is that it adds moisture to the air. This can help with a variety of things such as keeping wood furnishing, floors and trims from drying out. Added moisture is good for your skin, eyes, and hair. The pads also act as an air filter and give you cleaner air to breathe. This benefit helps to reduce allergy symptoms. Cleaner, moister air is, in fact, a great benefit. 20(L) x 20(W) x 8 (H) = 3,200/2 = 1,600 CFM. For this space you would look for a cooler with CFM of at least 1,600. Aside from the large roof installed models, there are two smaller styles of evaporative coolers. The window cooler is installed in a particular window in your home, so it will cool that room and the surrounding area depending on the square footage the unit is rated for. On average, they cost $400 - $1000. There are also portable units which give the homeowner more flexibility; they can be moved from room to room or positioned so the air is blowing in a different direction. The portable units may be perfect for smaller homes, condominiums or apartments where the window units would not work on upper flows or may not be allowed if you are renting the apartment. However, they require regular maintenance and the homeowner must keep the area ventilated and refill the water regularly. Portable units are available in a variety of sizes. There is a tiny one that is 2’ square and will cool 50 sq.ft. and has a 10-hour water tank; the price is $40-100. In the other extreme, there is a huge industrial-sized unit that will cool 6,250 sq. ft., whose price is $1,100-$5,000. Most homeowners will want a manageable size that may cool just one room. Price range for portable swamp coolers 1 is $100-$600; dependent on area of cooling coverage and other features specific to the unit, such as remote control, capacity of water tank, etc. Aspen pads or fixed fiber pads are made of shredded aspen wood fibers and last one to two years. They cost between $20 and $40 per pad. Rotating pad coolers are essentially pads sewn into a belt shape, which rotate or turn as they cool. They do not require a pump, and last about two to three years, costing $40 to $60 a piece. Rigid sheet pads are made of corrugated material that is stacked tightly together. They last much longer than other pads if water quality is maintained - up to four to six years. They cost around $50 to $80 a pad. Installation is relatively easy, taking about 2 hours. A professional plumber will be able to get this job done in 1-2 hours; labor for a typical plumber is $45-$65 per hour. Thermostats 3 are available for window evaporative coolers. This is nice and convenient to be able to set the temperature you desire. 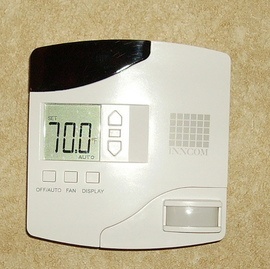 Thermostats 6 range in price from approximately $40 to $200. There are some units that are wireless and others are hard wired in. Installing the thermostat would be similar to installing an electrical outlet and should not take more than one hour. The most it would cost is $85 for the high end electrician. A purge pump 4 works well to clean the water from the system which in turn cleans the air as well. Purging the water can extend the life of the pads. Varying pumps 4 purge at different time intervals such as every 6 or 8 hours. Prices range from $50-$120. Swamp coolers 1 work best when there is a good balance between the air coming in and the air going out. One way to find this balance is to slightly open a window. If you do not want your window open you can install ceiling vents to keep the in and out air balanced. Ceiling vents cost about $4 to $25 a piece depending on size and style. Window evaporative coolers reduce the chance of roof leaks. Regions that have arid climates and hot temperatures are ideal for the evaporative cooler. Since the cooler adds moisture to the air, the less moisture there is in the beginning, the better and more efficient the cooler is. Regular maintenance will keep your cooler working more efficiently, effectively and longer. Your cooler should be drained monthly and the sediment washed out. The pads need to be replaced regularly; twice during the high cooling season. Also, check the pump 4, reservoir, pads, filters for cleaning. Do not run your air conditioner and evaporative cooler together. They would just work harder because they would work against each other. One would be adding moist air and the other would be taking it out. Some regions require building permits to install something that is electrical or changes the exterior of a building. Check with your local governmental office to see if you need a permit. Some electric companies offer rebates for installing a new energy efficient swamp cooler 1. The rebate can be as much as $300 which would go a long way toward paying for the cooler itself. Check with your electric company, many times they have a list of rebates for installing various appliances. How much does it cost to install a window evaporative cooler in my city? Cost to install a window evaporative cooler varies greatly by region (and even by zip code). To get free estimates from local contractors, please indicate yours. Cost Considerations: Evaporative coolers cost half as much to install and 1/4 as much to run as air conditioners. Their cost ranges from $360 for a window unit to $940 for a whole house unit that cools up to 1,100 sq. ft. They do however require much more frequent maintenance, and as many evaporative cooling units are located on the roof, this means it will be necessary to go on the roof to do the maintenance. Water that is high in mineral content. It often leads to a buildup of scale. Cost Considerations: Hard water can damage the equipment it passes through, such as boilers and pipes. Therefore softening the water can help avoid costly repairs.